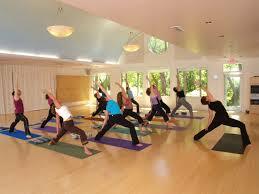 I have been feeling stressed lately and a friend of mine recommended I try a yoga class at the ladies gym in town. She said it helps you relax and she loves the instructor. I didn’t think I had anything to lose, after all, they sit on the floor and stretch and breathe. So, I bought a cute little yoga outfit, cropped pants, sports bra, and tank top. I should have known I was in trouble when it took me five minutes to get into the torture device a.k.a. sports bra. When I arrived at the gym, the class was ready to begin and the instructor told me to grab a mat and to take off my shoes. AHHHH, YUCK, use a mat someone else had used and take off my shoes where others walk and sweat. But, I obeyed her because she was built like five foot Marine sergeant. As I hesitantly took off my shoes and sat on a germ infested mat, the drill sergeant was talking to another student about how she was trained by some yoga guru in California. The second reason that I knew I was in trouble, she trained in California, the land of yoga, meditation, health nuts, and exercise. Everyone sat cross-legged on their mats so I did, too. The tiny teacher told us to breathe in and out our nose. I was thrilled that I could do that move. She instructed us to relax our shoulders and let the day fall away. I could do that, too. I was loving it so far. Then, she said an unfamiliar word and all the women popped up, head down, bottom in the air, feet apart. By the time I unfolded my crossed legs she said another unfamiliar word and the women popped up again then went into another move and pose. I didn’t know what to do. Go back to head down move just to catch up or put my left hand on my thigh, right arm over my head, and lunge into the next pose. In the first five minutes of the class I learned that yoga is more than learning to relax, it is contorting the body, it is moving from pose to pose, and IT IS TORTURE! That little blonde California- trained girl was awesome and I was not. Every time I put my head lower than my body I had a pain in my temple, shooting light in my eyes, and I knew immediately I was getting a yoga migraine. Blondie kept saying breathe, breathe, breathe to the class. I couldn’t decide whether to breathe or try to keep up with the moves. It was such a beautiful thing to watch as these ladies of all ages knew exactly what to do and their thin, lithe, toned bodies obeyed. To keep from throwing up I decided to simply sit and watch. I felt foolish and the longer I sat there, the more anxiety I experienced. I thought back to when I was in my thirties and I did aerobics everyday of my life. I have never been athletic but I have been physically active. I felt like an aging loser. No wonder I have gained weight I can’t even sit cross-legged without getting stiff. In about two minutes, I knew I had to leave the class or I was going to have a full-blown panic attack. My heart was racing and all I could think about was the migraine that was coming on all too quickly. I beat myself up about that class. In my pursuit of relieving stress, I ended up with a lot more anxiety. When I arrived home I told my husband and we had a good laugh. That night when I said my prayers before going to bed, the Lord brought to mind scripture after scripture. But the one I remember most is Psalm 55:22, “Cast your burden upon the Lord and He will sustain; He will never allow the righteous to be shaken.” His Word reminded me to cast my stress and anxiety on Him. Will I still experience stress? Yes, I will. But now, I will run to the Lord first and He will sustain me. His Word guarantees His sustaining power. Will I go back to yoga? Probably not. But I did learn a good lesson about the importance of exercise from my ONE yoga class. I am not getting any younger, if I want to be fit, I better get back on the treadmill while I can still walk.